Description: This Gumby figures belonged to Collin LaCroce. Collin moved to Wilmington 1986 when his mother took a job at New Hanover County Museum, now Cape Fear Museum. Collin attended Gregory Elementary, Myrtle Grove Middle, and Hoggard High schools. 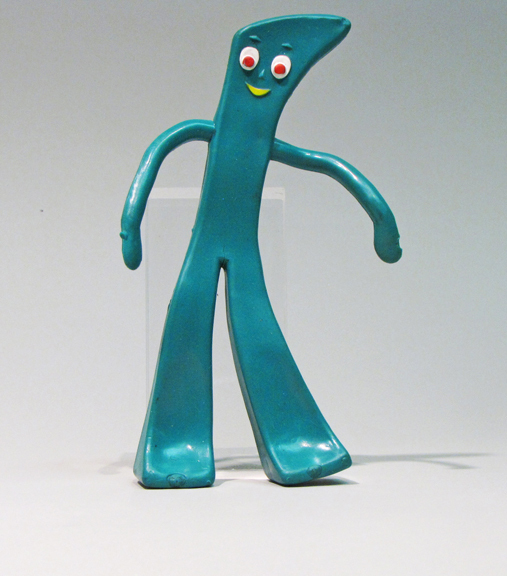 History: Art Cloakey created Gumby in 1955, and The Gumby Show aired on TV the following year. Gumby met his friend Pokey when he saved him in episode three and the pair became friends. Gumby and Pokey became bendable figures in the 1960s. After going off the air in 1969, Gumby experienced a renaissance in the late 1970s and early 1980s, fueled in part by comedian Eddie Murphy’s spoofs on Saturday Night Live. New watchers were introduced to the characters in the 1990s through cable TV. More than 40 years after they became bendable plastic toys, Gumby and Pokey are still on the market.